Azure App Service now supports Java SE on Linux - Support for Java SE 8-based applications on Linux in Azure App Service is now available in public preview. Now you can build and deploy Java web apps on a highly scalable, self-patching web hosting service where bug fixes and security updates will be maintained by Microsoft. Additional performance features include scaling to support millions of users with multiple instances, applications, and regions in a dynamic scaling intelligent configuration. Build richer applications with the new asynchronous Azure Storage SDK for Java - Azure Storage SDK v10 for Java is currently in Preview and supports Blob storage only. Azure Storage SDK v10 for Java adopts the next-generation Storage SDK design providing thread-safe types that were introduced earlier with the Storage Go SDK release. This new SDK is built to effectively move data without any buffering on the client, and provides interfaces close to the ones in the Storage REST APIs. Security Center’s adaptive application controls are generally available - Adaptive application controls help you define the set of applications that are allowed to run on configured groups of virtual machines (VM), which helps you audit and block unwanted applications. By default, Security Center enables application control in Audit mode. After validating that the whitelist has not had any adverse effects on your workload, you can change the protection mode to Enforce mode. This feature is available in the standard pricing tier of Security Center. 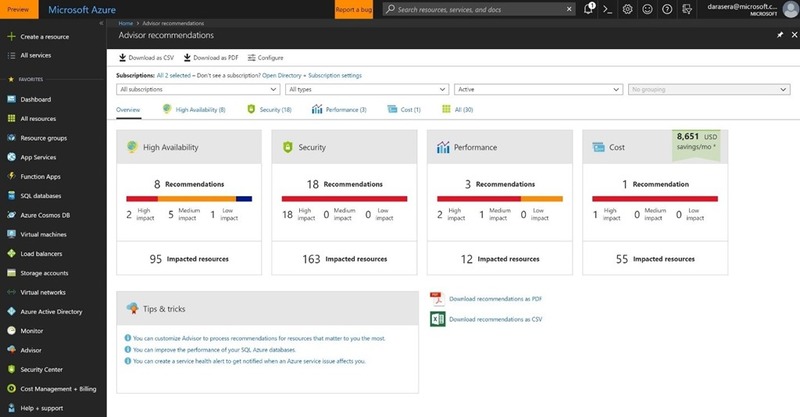 New recommendations in Azure Advisor - Azure Advisor is a free service that analyzes your Azure usage and provides recommendations on how you can optimize your Azure resources to reduce costs, boost performance, strengthen security, and improve reliability. Several new Azure Advisor recommendations to help you get the most out of your Azure subscriptions, such as when to use Reserved Instances to help you save over pay-as-you-go costs, when you have subscriptions missing Azure Service Health alerts, when you should consider upgrading to a support plan that includes technical support, recommendations to solve common configuration issues with Traffic Manager profiles, and more. Build secure Oozie workflows in Azure HDInsight with Enterprise Security Package - You can now use Oozie in domain-joined Hadoop clusters. Oozie is a workflow and coordination scheduler for Hadoop to accelerate and ease their big data implementation. Integrated with the Hadoop stack, Oozie supports several types of Hadoop jobs, but was previously unsupported with domain-joined clusters. Accelerated and Flexible Restore Points with SQL Data Warehouse - SQL Data Warehouse (SQL DW) is a fully-managed and secure analytics platform for the enterprise, optimized for running complex queries fast across petabytes of data. We just released accelerated and flexible restore points, which will help you to quickly restore a data warehouse offers customers data protection from accidental corruption, deletion, and disaster recovery. You can now restore across regions and servers using any restore point instead of selecting geo-redundant backups, which are taken every 24 hours. Top feature requests added with Azure Blockchain Workbench 1.2.0 - The second update of Azure Blockchain Workbench, which released to public preview at Build in May, is now available. You can either deploy a new instance of Workbench through the Azure Portal or upgrade your existing deployment to 1.2.0 using an upgrade script. This release includes a number of improvements and bug fixes, some of which are in response to customer feedback and suggestions. The Azure Podcast | Episode 239 - Kubernetes Developer Tooling - We talk to Azure Engineer Michelle Noorali about her passion with the Cloud Native Computing Foundation and the work she does to enable Developers to work easily with Kubernetes in Azure and any cloud. Orchestrating production-grade workloads with Azure Kubernetes Service - Brian Redmond, Cloud Architect, Azure Global Black Belt Team digs into the top scenarios that Azure customers are building on Azure Kubernetes Service on the third anniversary of Kubernetes. Azure Kubernetes Service (AKS) manages your hosted Kubernetes environment, making it quick and easy to deploy and manage containerized applications without container orchestration expertise. It also eliminates the burden of ongoing operations and maintenance by provisioning, upgrading, and scaling resources on demand, without taking your applications offline. Feeding IoT device telemetry data to Kafka-based applications - With the newly released support for Kafka streams in Event Hubs, it is now possible for Azure IoT Hub customers to easily feed their IoT device telemetry data into Kafka-based applications for further downstream processing or analysis. You can start using IoT Hub's native support for messaging, device and configuration management early, and defer the decision to migrate your telemetry processing applications to natively use Event Hubs at a later time. This post covers applicable customer scenarios and how to use Kafka-based applications with IoT Hub telemetry. The IoT Show | Kafka Integration with Azure IoT Hub - Whether you are a Kafka aficionado or you are simply curious about how Azure IoT Hub allows to easily consume IoT devices data from Kafka, this new episode of the IoT Show is for you! Free course on the Log Analytics query language (KQL) now available - Some of the most commonly asked questions we get in Azure Log Analytics and Application Insights are around the query language. These come both from beginners who need a hand getting started, and intermediate users who want to know what advanced capabilities are available to them. We teamed-up with Pluralsight to provide a free course on KQL. Register and get started today. Azure Friday | ACR Build: Automate Docker builds with OS and framework patching - Steve Lasker joins Lara Rubbelke to discuss ACR Build, a cloud-native container build solution enabling pre-check, git commit and base image update docker builds for OS and framework patching. Azure Friday | Azure Stream Analytics: Managing timelines and coding on IoT Edge - Jean-Sébastien Brunner joins Lara Rubbelke to discuss new features that enable you to implement the intelligent cloud, intelligent edge vision for streaming analytics: Stream Analytics running real-time analytics with custom code on IoT Edge. We also discuss substreams, which is a new time management feature for independently processing the timeline of each device (very useful for an IoT scenario), and the recently announced Session Window. Containerize Your Applications with Kubernetes on Azure - In this webinar on Tuesday, August 14th (10:00-11:00am Pacific), you’ll see an end-to-end Kubernetes development experience on Azure, showcasing an integrated development environment for building apps. This includes application scaffolding, inner-loop workflows, application-management frameworks, CI/CD pipelines, log aggregation, and monitoring and application metrics. Azure Marketplace new offers: June 16–30 - The Azure Marketplace is the premier destination for all your software needs – certified and optimized to run on Azure. Find, try, purchase, and provision applications & services from hundreds of leading software providers. In the second half of June we published 22 new offers, including virtual machine images, web applications, container solutions, and consulting services. Announcing availability of Azure Managed Application in AzureGov - Azure Managed Applications enable Managed Service Provider (MSP), Independent Software Vendor (ISV) partners, and enterprise IT teams to deliver fully managed turnkey cloud solutions that can be made available through the enterprise Service Catalog of a specific end-customer. Customers can quickly deploy managed applications in their own subscription and rely on the partner or central IT team for maintenance operations and support across the lifecycle. Marketplace news from Inspire 2018 - Key marketplace sessions and content from Microsoft Inspire is now available for on-demand viewing, including: Grow your business with AppSource and Azure Marketplace, Best practices for successful GTM in Azure Marketplace and AppSource, Grow your PaaS or SaaS business in Azure Marketplace or AppSource, and Optimize your Microsoft Marketplace listing to attract new customers. Avoid Big Data pitfalls with Azure HDInsight and these partner solutions - Big data and the analytical application lifecycle spans a number of steps. Including ingestion, prep, storage, processing, analyzing and visualization. All of these steps need to have enterprise requirements around governance, access control, monitoring, security and more. Stitching an application together which comprises everything is a complicated task, which is why we worked closely with a selected set of ISV’s to certify their solutions with Azure HDInsight and other analytical services so customers can deploy them with a single-click. Check out this post for an overview of each of these solutions. Internet of Things Show | First look at Maps in Azure IoT Central - Azure Maps is now fully integrated in Azure IoT Central applications offering plenty geo-location and geocoding features. Check out this cool demo by Miriam Berhane Russom, PM in the Azure IoT Central team. Internet of Things Show | Azure IoT Hub Manual Failover - Disasters can happen and you should always be ready for failures in any distributed systems. Cloud services are no exception and Roopesh Manda, PM in the Azure IoT team, tells us how the IoT Hub will ensure your IoT application resiliency and how you can use the new Manual Failover feature of the service to test catastrophic scenarios. Insurance | IoT: the catalyst for better risk management in insurance - Insurance companies that embrace digital transformation and technologies that include the Internet of Things (IoT), Artificial Intelligence (AI), Machine Learning (ML), and Big Data will lead the industry. Learn more in this post about thought leader Matteo Carbone's book, All the Insurance Players Will Be Insurtech. Retail | How to move your e-commerce infrastructure to Azure - Moving an existing e-commerce solution to the cloud presents many benefits for an enterprise: it enables scalability, it offers customers 24/7 accessibility, and it becomes easier to integrate cloud services. But first, to move an e-commerce solution to the cloud is a significant task, with costs that must be understood by a decision maker. Migrating your e-commerce solution to Azure overview explains the scope of an Azure migration with the goal of informing you of the options. The first phase begins with IT Pros moving the components to the cloud. Once on Azure, he describes the steps the e-commerce team can take to increase ROI and take advantage of the cloud. Healthcare | Current use cases for machine learning in healthcare - Machine learning (ML) is causing quite the buzz at the moment, and it’s having a huge impact on healthcare. Payers, providers and pharmaceutical companies are all seeing applicability in their spaces and are taking advantage of ML today. This post provides a quick overview of key topics in ML, and how it is being used in healthcare. A Cloud Guru | Azure This Week - 27 July 2018 - In this episode of Azure This Week, Lars looks at the public preview of Azure Service Fabric Mesh, Azure Security Center integration and the general availability of Azure File Sync. He also looks at Azure Cloud Shell which is now embedded inside Visual Studio Code.